Award winning duo The Boyds, who's Edinburgh Festival Fringe shows have sold out for the last three years, take to the Arts Centre stage for a night of acoustic music by two of the UK's best loved artists. The evening is packed with two shows in one, with all the best hits from Bowie and Queen. In the first half Gus and Liz perform the fantastic songs of 'The Duke' with well crafted, stripped back versions of the tunes that are regarded as timeless. Sweet two part harmonies weaving with percussive guitar work cover all the Bowie hits including Space Oddity, Starman, Ziggy Stardust, Let’s Dance, Rebel Rebel and more. After the interval we go through the decades of the legendary Queen with creative, well crafted acoustic versions of their iconic back catalog. 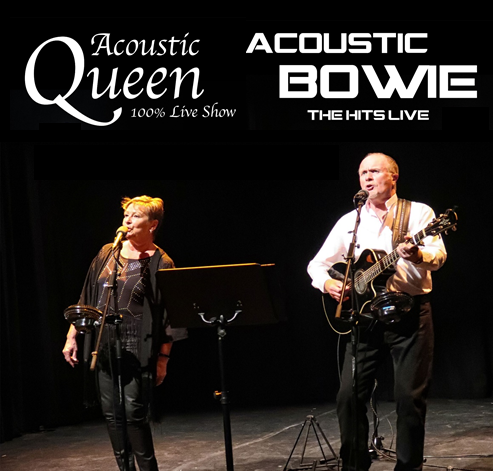 Packed full of all the favorites such as Bohemian rhapsody, Radio Ga Ga, We are the champions, Crazy little thing called love and much much more, guaranteed to have you singing along to these beautiful acoustic renditions.